April is Child Abuse Awareness Month. When I got on Facebook today, I noticed someone had shared something I wrote two years ago. Fear is not a good thing. When a child’s brain is wired with fear from harsh/abusive parenting, he/she will likely suffer with anxiety for the rest of his/her life. This is not good and can make the person feel like a failure because no matter how hard he/she tries, he/she can’t always overcome the intense, overwhelming fear and anxiety. Please use trust, connection, and love to parent. Stay tuned! I hope to get more posts written. 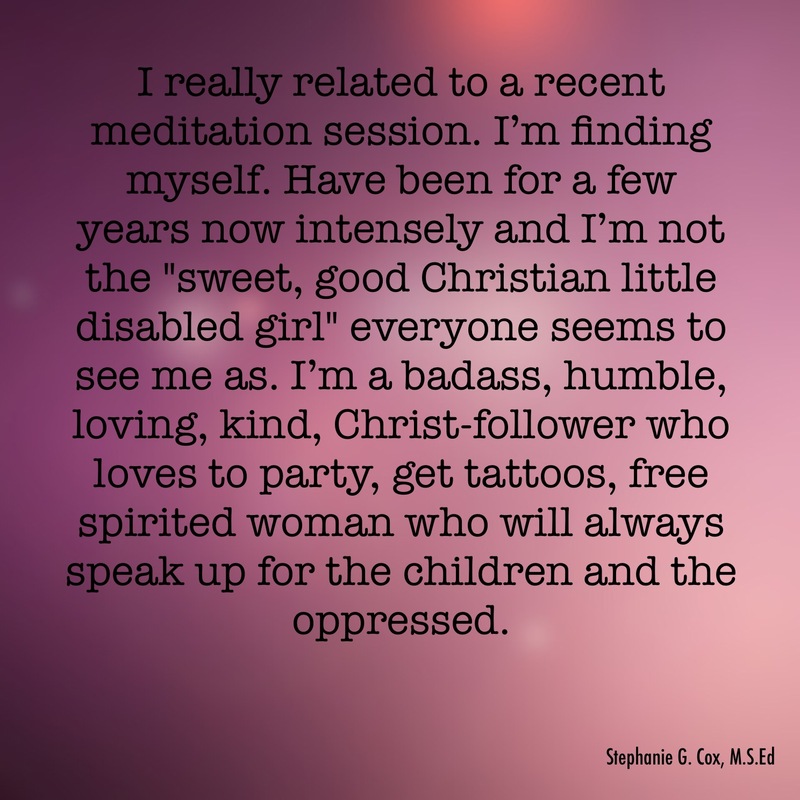 Fear Of Failure, Cerebral Palsy, And A Tattoo! I just got my first tattoo last week. I was so nervous because I can’t control my muscles at all due to my severe cerebral palsy and I hate pain. But I am now the proud owner of a tattoo in honor of my grandpa who went Home in May. I know some people believe it’s against the Bible to get a tattoo but when you study the cultural and historical context of the Bible, pagans were doing it for other gods. Plus, it wasn’t sterile or at all like it is now if you go to a reputable tattoo parlor. Here is a great article about the cultural and historical context of the Bible when it comes to tattoos. I felt God with me the whole time and He put the verse, “I can do all things through Him who gives me strength” in my head that morning and while she did it. Plus, I feel closer to my mom having a matching tattoo with her! The whole thing has been wonderful and all good things come from God! And my tattoo comforts me every time I miss my grandpa. I have wanted a tattoo for years but didn’t think I could stay still for it, especially since pain and anxiety make me move more. So the first thing I did once I decided I was definitely doing this was to Google “people with cerebral palsy getting tattoos.” I was very encouraged to find many people with cerebral palsy have tattoos. Even so, I was still anxious about whether or not it would work for me. After researching this thoroughly, my husband and I went in August to meet with a tattoo artist at our local tattoo parlor which came highly recommended. I was very nervous when we went because I figured that they would see my involuntary movements and reject me. I am terrified of rejection because I have been rejected so many times throughout my life. Rather, I was met with total acceptance! The guy we met talked to me like everyone else and listened when I talked. That means A LOT to me since some people look at my severe disability and assume that I am mentally disabled. And my speech is very slurred making it difficult to understand me if you don’t know me well. I immediately told the tattoo artist that I can’t control my muscles so I was worried if it would even work. He asked where I wanted the tattoo and I had him feel my thigh so he knew how the muscles would contract. Of course we explained that we’d make my feet straps tighter and that my mom would be here to help hold me. I also took medicine to help control some of my spasms. I was so excited for the next three weeks. I was also very nervous because even though the artist and the shop owner didn’t think there would be any problem with doing a tattoo on me, I was terrified that I would fail. Ever since I was very young, I have been terrified of failure. As you can read in this post and this post, many people would look at me and not believe I could do things. I learned from a very early age that I had to always prove myself to people. Plus, I was verbally abused by various people growing up and I saw how my dad reacted angrily when my older siblings didn’t live up to his expectations. I still feel like this today. So I felt like I had to prove that I could handle the tattoo. I can’t stress enough the importance of building our children up. They need to learn how to believe in themselves. This does not mean we make them proud as humility is a virtue. But humility does not mean feeling like you never measure up or always have to be afraid of failing. Humility means that you put others before you and you don’t think you’re better than everyone else. But feeling poorly about yourself is not humility. Nobody should have to struggle with anxiety like I do due to how I was treated as a child and throughout my life by certain people. Thankfully, my husband and mom had complete faith in me as did many of my friends. Well, the night before my tattoo appointment my artist who was supposed to do my tattoo contacted us because something came up and he couldn’t do it the next day. Yes, I had a little panic attack but he made sure someone else could do it. The lady we got was wonderful. She has done tattoos on people with cerebral palsy and multiple sclerosis. That helped put me at ease. The day of my tattoo, I was so nervous. Again, I was afraid that I would fail. That the pain would be too much for me and I would move too much. But Candace immediately put me at ease. She was quickly able to figure out my spasms and work around them. Every time she initially put the needle down, my startle reflex would make me jump. But once that happened, she knew to keep going and I was fine. There were a few “ouch” moments where I made my husband talk more and I had to distract myself more but it wasn’t bad. I now have a BEAUTIFUL purple Mickey Mouse outline and a BEAUTIFUL red Corvette outline in honor of my dear grandpa! She was gentle and it was over before I knew it! I hugged her as I was so happy with her work. The significance of my tattoo: Mickey Mouse is because when I was 15, Grandma and Grandpa took me to Disney World over my Christmas break. We saw the Christmas parade, rode on rides, and they arranged a private meeting with Mickey Mouse and Minnie Mouse and Goofy and other characters. I believe in signs from people in Heaven and ever since Grandpa went Home, I’ve seen Mickey everywhere despite Hello Kitty being more popular than Mickey nowadays. The Corvette is because my grandpa LOVED Corvettes. He was never without one since I was born. He was a mechanic and worked for BF Goodrich and loved working on cars. So he would buy Corvettes, fix them up, enjoy them, then sell them. My mom is a Corvette owner after 50 years, so getting the red corvette honors him for both of us AND is fun to have matching tattoos with my mom! I have a major sense of accomplishment and I’m grateful to God for helping me through it! I loved watching my mom get her matching Corvette in honor of Grandpa who was her dad. And whenever I miss my grandpa, I just look at my tattoo! I don’t know if I will ever be free from my fear of failure. But I do know that God wants me to use my pain to help others. Children deserve nothing but respect as do people with disabilities. Just because I am severely disabled does not mean I can’t live a “normal as possible” life. We just need more assistance. If you are reading this and want a tattoo that is meaningful to you and you’re disabled, I’m living proof that you can do it! We can do all things through Him who gives us strength! My tattoo in honor of my dear grandpa (April 1, 1928-May 2, 2016). my mom’s and my matching tattoos. I’ve had this realization: When people are defending spanking and they commonly say that they never feared their parents, they are right. They didn’t and don’t feel the fear. The emotion is the energy and the feeling is the consciousness of that energy. They were numb to their fear, so since they can’t feel it, they make the assumption that it isn’t there. So when we understand that when the brain perceives danger and alarm is activated in us, we are first to be moved to caution and if that isn’t possible, we are to be moved to tears and if that isn’t possible, we are to be moved by courage. When we become numb to our feelings of alarm, then instead of caution, we are moved to be reckless. You see that with children and adults who are adrenaline junkies, dare devils, and danger seekers. They are numb to their fear. Thus, they are called fearless. Courage is not the absence of fear. It is the mix of fear and desire. So when the parent becomes a source of alarm to a child, in order for the child to hold on to the relationship, the brain has to numb their fear. Which puts them in a dangerous position. Because what if they also put themselves in harms way with other people, because they can’t feel their alarm. So that little voice, that sensation that warns of danger, can’t be heard because they have become deaf to it. Parents should never be a source of fear and alarm to a child! They need to be a source of safety. A place where natural fear and alarm can be, understood, supported, and empathized with. Relationships Matter. God Is A Relational God. As I have been corresponding with people who are on the fence about gentle discipline, it hit me that God is a relational God. Everything He does is to get us to become closer to Him. That’s why it makes me sad that so many Christians believe that He does bad things “for our good.” That doesn’t make us feel closer to Him unless we have some sadomachistic tendencies going on in us. When it comes to disciplining our children, I find myself covering the same issues with punitive parents who just don’t understand what discipline really is. So I am going to cover it again here. Discipline looks at the whole child instead of focusing on behavior. When you understand the child and where he/she is in his/her development, you can set appropriate limits and figure out the whys behind behavior. Children are so much more than a set of behaviors or “sins.” They are complicated, competent human beings that need our guidance. They are new to this world and have immature brains and bodies. This should not be used against them, but it often is. Going from using external control such as spankings, time-outs, and taking away privileges in an arbitrary way to using internal motivation by meeting needs, setting limits, allowing natural consequences of choices to happen, validating feelings, allowing appropriate choices, giving alternative appropriate behavior and/or ways of expressing feelings, using time-in to settle down with the children and connect instead of isolating them is tough. It takes a lot of work and patience. We use the Fruit of the Spirit A LOT when we choose to discipline rather than punish. But this is true discipline. To grow heathy fruit, we must cultivate it, water it, and give it plenty of sunshine. We must also do our best to protect it from the enemy, usually bugs and other animals. We don’t beat the sprouts and fruit as that would ruin it. So why do it to our children by beating them? Also, I am sure I have covered this in other posts, but I know people learn through repetition too so I will cover this again. Fear and respect mean two totally different things. Notice fear contains the word “evil” in its definition but respect doesn’t. And throughout the Bible God tells us to NOT be afraid. Therefore, to be reverent means to respect, not afraid. 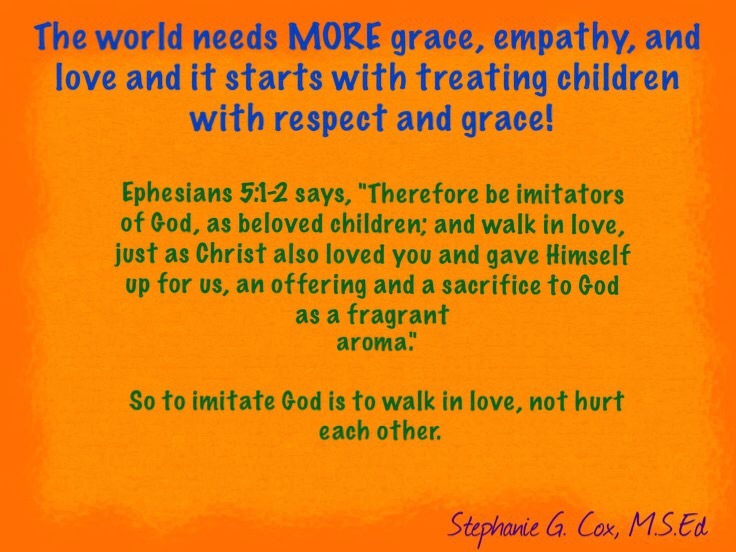 Since God is a relational God, shouldn’t we do everything in our power to treat our children in a manner that produces a healthy relationship with us? We work hard to have good marriages by treating our spouses with love and respect. Why should it be any different with our children? God is over us and yet He calls us His friends (John 15:15, James 2:23, Romans 5:10). May we treat our children how God treats us. Paddles Are For Boats, NOT For Hitting Children! This story of a kindergartner being held down and paddled for spitting at another child in a Georgia school really upset me! And, of course, the pro-spankers are in full force cheering about this and insulting anyone who dares to disagree with them, thus, showing once again that lack of empathy is a negative effect of being spanked/hit. No one with an ounce of empathy could be supportive of this. Plus, you can’t hit a child with a large wooden paddle if you have any empathy! There are a few points I want to cover in this post. I know I keep saying this stuff in different ways over and over again, but until the abuse of children ends, I will never stop speaking out for children. After all, children are human beings! The first thing that struck me as I half watched the video of the kindergartener about to be paddled/hit at that school in Georgia was the paddle was almost as big as him! A small child got hit by a big wooden paddle. Am I the only one who sees a major problem with this? I can’t even imagine how painful and scary that was. We had a paddle with holes in it at my house growing up and I was terrified of it even though, thankfully, I was never hit with it. But I saw it used on my siblings. Hitting a small child with a big paddle can cause major injury. And from the testimonies I have heard from people who were paddled at school, the staff don’t hold back much when hitting the children. This is very disturbing. And even if they flick their wrist first, most children have lower pain tolerances than adults do. I can guarantee that kindergartener was in a lot of pain after the spanking/hitting which is not a good thing! Imagine having to sit the rest of the day in a hard desk after being hit hard by a wooden paddle that was almost as big as you! Could you focus? Could you learn? Of course not! Research shows that pain and fear inhibit learning. Plus, Kindergarteners should be playing, not sitting in desks! Corporal punishment should never be used with children! It is time to ban it in all schools and homes! It is not your “right to hit your child with a paddle, wooden spoon, paint stick, tree branch, or hand.” Can you imagine how scary school is for the children in the nineteen states that still allow corporal punishment in schools? It does not make children better behaved either. So, how would I handle a child who spit? I would explain that spitting is gross and would have given him alternative ways of handling conflict after hearing what happened from both children. I would guide them through conflict resolution. And I would have told the child that he may spit outside on the ground or in the bathroom toilet. It’s all about being willing to discipline (teach and guide) instead of punishing them. After all, paddles are for boats, NOT for hitting children! Extinction. This is the fear of death. Mutilation. This is the fear of losing body parts or being physically hurt. Loss of Autonomy. This is the fear of being physically disabled or not having control over situations. Separation. This is the fear of being left behind or isolated or losing loved ones. Ego-death. This is the fear of being humiliated or shamed. Therefore, I think of these primal fears as more survival instincts. They keep us from putting ourselves in danger. They are God’s way of keeping us safe. Separation is one of my major fears, or, I guess, survival instincts. It is extra strong in me. I have lost a lot of people throughout my life. Whether it was due to rejection or death or people moving away, the fact is loss scares me. I have been on overdrive lately when it comes to losing people due to losing my mother-in-law, to whom I was quite close, in August 2015. So if a friend starts to back off due to life, I feel the road to rejection and loss coming all over again. I freak. This is from the book, “Healing After Loss” by Martha Whitmore Hickman. This further proves our God given need for companionship especially during rough times. I hate blaming my severe cerebral palsy on anything, but I must wonder if I would experience less loss if I wasn’t disabled. I would more easily make friends and could physically contribute more to friendships such as spontaneously meeting friends somewhere without having to plan it all out. I was also physically, emotionally, and verbally abused by my dad throughout my entire childhood. Then he disowned me in my adulthood. That gets into separation instinct as well as ego death. We all need to feel valued and loved from day one. Of course there is another major reason why some people’s separation instinct is on overdrive. Being left to cry-it-out as infants teaches children to expect separation and loss. The brain gets wired in such a way that instead of having a healthy survival instinct, it goes into overdrive. Then if the child continues to experience loss, that further increases their survival instinct and fear of separation and loss. I must point out that separation anxiety in infants and toddlers is developmentally appropriate. Parents and caregivers can help children with separation anxiety by always telling the child when they will be back as well as always saying goodbye to the child instead of sneaking out. This helps children not be on high alert to make sure people won’t just suddenly disappear. You know, God created us to need human and animal companionship. Therefore, a healthy separation survival instinct would be to recognize our need for relationships without always worrying about losing the people we love. When God saw that Adam needed additional companionship, He created the animals for him. Then when they weren’t enough, God created Eve. Yes, God fills up a certain major need in us, but He knows we need other relationships on this Earth. I know that may be a weird idea for many Christians as the church teaches us that God is all we need. And indeed, there is nothing that can ever compare to God’s perfect, unconditional love for us. But if all we need is God, then why did He create us with a separation survival instinct? This is why infants need us to respond to them consistently and respectfully when they cry or they will have brain damage that may not be apparent to the naked eye but will surface in some manner at some point in their lives. It will negatively affect every relationship they ever have. I believe we need to cherish every relationship we are in and do our part in nurturing it. Yes, some relationships must take priority over others. But God doesn’t want us walking away from relationships in which He put us unless they have become toxic. And our relationship with Him comes first as that is how we can make sure we are treating each other how He wants. ”Then the Lord God said, ‘It is not good that the man should be alone; I will make him a helper fit for him'” (Genesis 2:18, ESV). “Two are better than one, because they have a good reward for their toil. For if they fall, one will lift up his fellow. But woe to him who is alone when he falls and has not another to lift him up! Again, if two lie together, they keep warm, but how can one keep warm alone? And though a man might prevail against one who is alone, two will withstand him—a threefold cord is not quickly broken” (Ecclesiastes 4:9-12, ESV). “Having purified your souls by your obedience to the truth for a sincere brotherly love, love one another earnestly from a pure heart” (1 Peter 1:22, ESV). “For the whole law is fulfilled in one word: ‘You shall love your neighbor as yourself’” (Galatians 5:14, ESV). May we raise our children in a manner that will allow them to have a healthy separation survival instinct. May we also teach them to value all relationships and friendships–especially the one they have with Jesus. After all, Jesus is our friend. Yes, companionship is vital to our well being and survival!